Q: What’s included in the goodie bags and how do goodie bag upgrades work? Upgrades are available for usually $6 –15.00 each goodie bag. I have different items all the time and order accordingly as well. Let me know your price range and some suggestions, I’ll work with you. These items have included purses, makeup bags, lip-gloss, mirrors, fancy hair ties, lotion, chocolate bars, diary-books, fancy note sets, jewelry bead kits, stamps ‘n ink & more. I attempt to accommodate some themes such as ballet, soccer etc, so let me know, the earlier the more shopping/ordering opportunities I have to help you! Q: I have a younger sibling that may join the party but he is only 3 years old, what will he do while the party is going on? A: I work with ages 4 and up. These situations may be solved differently depending on the party theme being held. My usual advice is to have someone there to help the younger sibling(s) so the bulk of attention is given to the birthday child & his/her friends. We can discuss your specific situation and suggestions I may have for you. Q: Having a Tie Dye Party makes me worried about the weather forecast. Do you have rain dates? A: No, I usually do not need to have rain dates unless you prefer this, just let us know. All of the other non messy steps are done inside, where we gather in a circle on the floor. The homeowner should have a backup plan, like a garage where we can lay plastic sheeting down for the dye application portion of the party. Q: Why send a deposit? A: To send us a booking form and deposit is the only way to hold a date and time. Sometimes we have multiple inquiries for one day. Even though we have a few party teachers, dates do fill quickly. Hi Laurie Lynne- I just wanted to thank you again for yesterday!! As everyone left they said what a great time they had and the best was when Jake said it was "the best party ever!". Another highlight was when Danielle my oldest thanked us for giving "her" the greatest party! It wasn't even her party!!! lol!! !If you ever need/want recommendations please don't hesitate to call me I am more than willing to give them to you! You and Katie were great with the kids and they all loved you!!! I feel like I've known you forever!! Again thank you so much for making Erin's party so craftastic!!! As I am writing this they are both rolling clay on their taped down mats, they had to be taped down because that's how Miss Laurie did it! Hope to see you again, maybe in April for Danielle's party. Laurie Lynne, I don't think I fully conveyed how pleased I was with Celia's party. It was just as I had pictured-thank you! A lot of the kids brought their creations to school the next day. And Celia is already talking about a tie -dye party! I will keep you in mind in the future, as well as recommend you to friends. 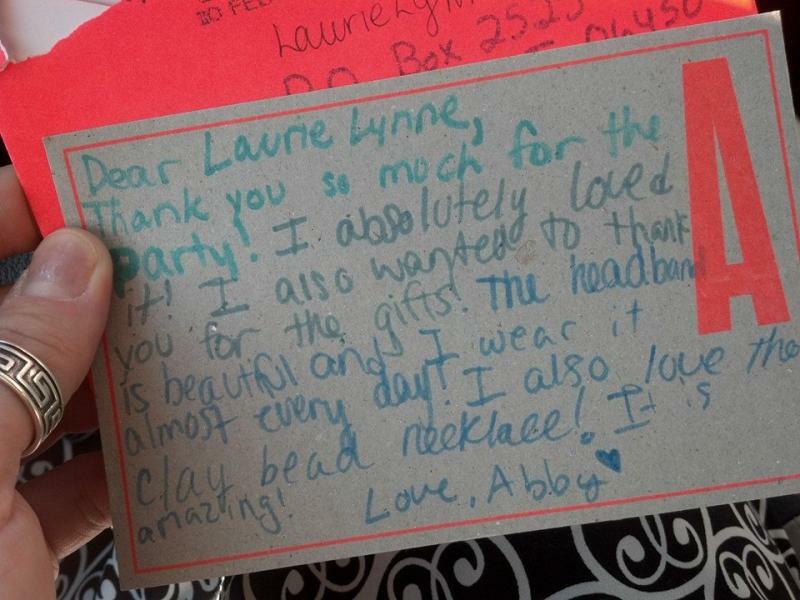 In February of this year we hosted a jewlery party for my 6yr old daughter's birthday, Rachel. For the past 2 yrs we have been looking for creative home birthday ideas. We've done the magician, and the balloon guy. However, this year we found you. Everyone in attendance, from the kids to the parents who stayed, had an awesome time. You did a WONDERFUL job with the girls and they all loved their jewlery. Especially, my daughter, the birthday girl! I will be calling you next year to host her 7 year old party -- It was not only her best birthday ever, it was THE best kid birthday I ever went to ! Laurie, Thank you so much. I'll send you the pictures. The girls all had a great time and the necklaces all came out so great! You are terrific with the kids! I really am interested in getting the adult girls together to make a necklace. I know my sister and I would love it and my other girlfriends would have a lot of fun. ...so many more to be added! They are in thank you cards and in letters from over the years! we travel throughout Connecticut, Westchester County NY, Putnam County NY and the borders of Massachusettes and Rhode Island.